An interesting old historic variety; said to have grown from a pip from the bag of apples stolen by a Ploughman who was shot for stealing. The resulting seedling was saved and nurtured by a fellow worker and the resulting tree was named in his memory. A very old variety, first described in 1883. 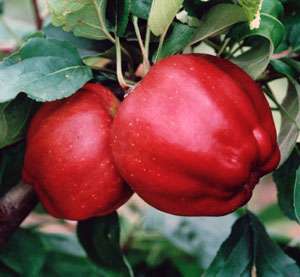 A medium large heavily ribbed apple, evenly and deeply coloured in blood red; sweet and juicy flavour, little acid. Why not enjoy this fascinating old heirloom as a space-saving supercolumn in your garden? Plant just 2' apart. Pollinates well withj Rajka, Saturn, Somerset Redstreak, Tomp Putt, Sunset, Red Windsor, James Grieve etc.